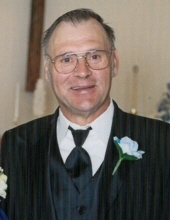 Harold Broderick, 70, of Pound, passed away unexpectedly Thursday, April 4, 2019 near Wausau due to a car accident. He was born June 17, 1948 to the late Wilbert and Lucille (Krause) Broderick. He graduated from Coleman High School in 1966. Harold worked for Patz Manufacturing Corp. for several years. He then worked for the canning company in Coleman. He moved on to work full time logging which was his passion, he loved to be out in the woods. Harold married the love of his life Margaret Hutchinson October 9, 1979, they were married 39 years. Harold lived to work and to deer hunt. Harold is survived by his loving wife Margaret, 2 sons Lucas (Ashley) of Pound; Adam (Tammy) of Iowa; 2 beautiful granddaughters Skylar and Valerie; one sister Nancy (Clifford) Patz, and 2 brothers James (Carol) and David (Kris) Broderick. The family will greet relatives and friends at Beaver American Lutheran Church on Tuesday, April 9th from 10 AM until the time of the Funeral Service at 2 PM with Pastor Christina Forsyth officiating. Harold will be placed to rest at Beaver American Lutheran Cemetery. Please visit RhodesCharapata.com to express online condolences. The family would like to extend a special thank you to the doctors and nurses at the Trauma –ICU Unit at the Aspirus Wausau Hospital for everything they have done. To send flowers or a remembrance gift to the family of Harold Broderick, please visit our Tribute Store. "Email Address" would like to share the life celebration of Harold Broderick. Click on the "link" to go to share a favorite memory or leave a condolence message for the family.